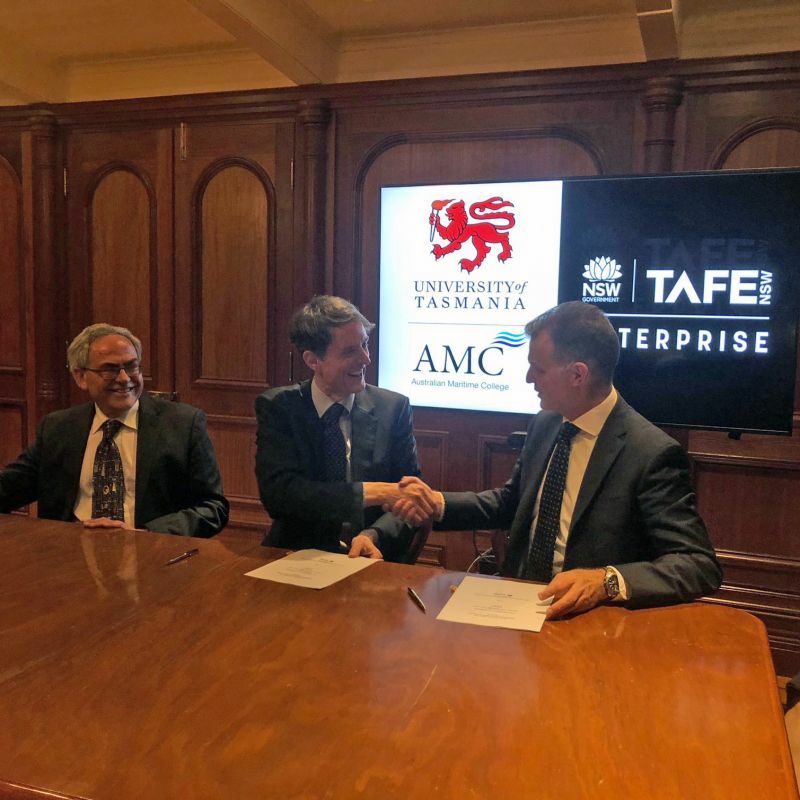 The two organisations have signed a memorandum of understanding to develop direct study pathways from TAFE NSW vocational education and training programs to the AMC specialist undergraduate degrees, particularly in the areas of maritime engineering and global logistics management. AMC students are also set to benefit with opportunities for reverse articulation to TAFE NSW’s vocational courses, allowing them to upskill and engage in ongoing professional development. University of Tasmania Vice-Chancellor Professor Rufus Black said the partnership was an important step towards building a pipeline of skilled workers for the naval shipbuilding projects in Australia. “The Federal Government’s investment in the continuous naval shipbuilding program has led to significant career opportunities for the next generation of engineers, project managers and logisticians,” Professor Black said. “As the national institute for maritime education, training and research, the Australian Maritime College has the expertise and infrastructure required to help build this capacity and support the goals of the naval shipbuilding program. We are very much looking forward to collaborating with TAFE NSW to create a study continuum so that more students in New South Wales can participate in the growth of the shipbuilding industry. This new memorandum of understanding builds on a longstanding partnership between TAFE NSW and AMC for articulation from their seafaring courses. TAFE NSW Chief Operating Officer, Glen Babington said the new partnership would provide a valuable opportunity to bring more young people through the doors eager to study in the areas of maritime engineering and global logistics management. “As Australia’s largest education and training provider, TAFE NSW prides itself on providing the practical training and relevant skills students need to get a job. We also recognise the changing nature of work and rise of new technologies, which is why we’re designing state-of-the-art training to skill the workforce of the future,” Mr Babington said. The collaboration with TAFE NSW follows similar agreements that AMC has forged with TAFE SA and South Metropolitan TAFE. (Photo): College of Sciences and Engineering Executive Dean, Professor Brian Yates, University of Tasmania Vice-Chancellor Professor Rufus Black and TAFE NSW Chief Operating Officer Glen Babington sign the memorandum of understanding.